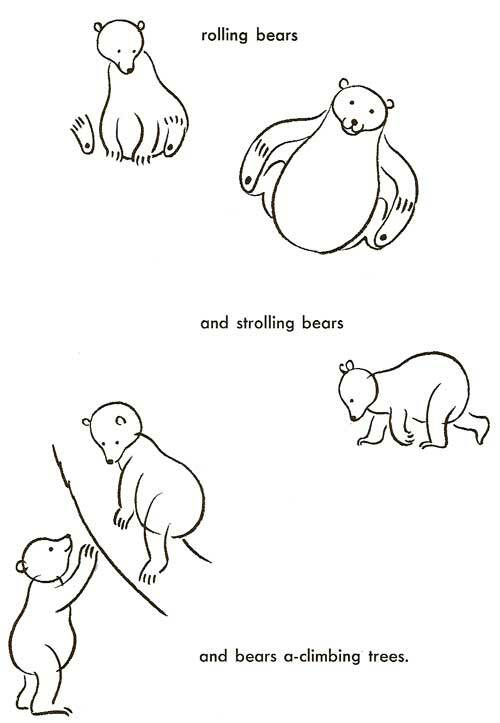 For reasons I do not understand, bears are not the top animals that most people want to learn how to draw. Usually dragons and tigers are what people want to know how to draw, but I am extremely glad I took the time to learn how to draw bears. There are bears where I live, and we have to be very aware of them both for our safety and to keep the bears wild (never, ever feed a wild bear). But after you get over your fear of bears, and learn how to live peacefully with them, all their best characteristics come out. For one thing, bears are extremely clever. Some are as smart as monkeys, particularly when it comes to getting into food stores. If you have ever seen a bear trying to get to a backpacker's strung up food bag, you will have wished you could have sketched the event. Actually, you can make any landscape drawing, or even a drawing of someone's backyard much, much more interesting by putting a bear in it, especially if you conceal the bear so people won't notice it at first. It will be such a surprise to them that every time you show them one of your drawings after that, they will be searching it to see what you've hidden in the composition.